Once again this week, a man refused to give Ichhya KC a bus seat entitled to the handicapped. The visually impaired 45-year-old was infuriated, and called out to a policeman when the bus stopped at a checkpost in Pharping. Finally, after the police pointed to the notice that said the seat was reserved for the physically handicapped the man relented. “If you don’t ask, people don’t offer you the seat 70 per cent of the time,” said KC. Though KC started losing her vision at five, it never stopped her from building a life for herself, working as a front desk manager with UKAid. 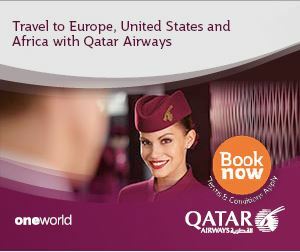 But that stint ended last year, and since then the English Literature masters student has struggled to find another job. The 2011 Census counted 96,000 visually impaired people in Nepal, with blindness affecting less than 0.5 percent of the population. “More than 70 per cent of the cases are avoidable,” explained Sanduk Ruit at the Tilganga Eye Hospital and Nepal’s internationally-renowned cataract surgeon. 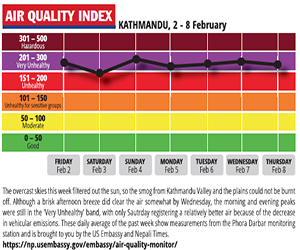 Nepal’s high blindness rate is due to cataracts, uncorrected refractive errors, and emerging factors like diabetes, glaucoma and trauma, Ruit said. According to WHO Visual Impairment and Blindness global estimates, the prevalence of blindness in India is higher at 0.7 per cent and China 0.6 per cent. Many have been pressing the government to prioritise awareness and access to education, employment, infrastructure and life skills training for the visually impaired, and although textbooks in Braille from Grade 1-10 have been introduced, the lack of books after SLC is a problem. “There is no trace of Braille after we complete Grade 10. We can’t write in Braille because teachers don’t understand it,” said Suprabha Aryal, a psychology student at Trichandra Campus. Students like Aryal must depend entirely on classroom lectures and have to arrange for writers to sit with them for exams. Additionally, annual revisions of textbooks make it hard for organisations like the Nepal Association for the Welfare of the Blind to translate them into Braille. “Publishers are very market driven, they cater to only sighted children,” says Gopini Pandey, education specialist at Save the Children (SCF). Laboratory School in Kirtipur, which introduced Braille in its curriculum as far back as 1964, is one of the few schools that provide inclusive education for visually impaired learners. With 53 blind students enrolled this year, six will be appearing for SLC this April. Sita Gyawali teaches Braille to students at the Laboratory School which has a dedicated room equipped with Braille slates, stylus and a embosser. “The investment is huge, and not every school opts for it,” said teacher Bindiya Shrestha at Laboratory which has a separate resource centre where teachers, both sighted and non-sighted, instruct children using computers equipped with Braille adapted embossers, slates and styluses. Still, Gopini Pandey at SCF said education is only an entry point and the government should also push for jobs opportunities for the visually impaired. The Public Service Commission of Nepal has granted 5 per cent of its budget for people with disabilities and private organisations have also been instructed to hire one person with a disability out of every 25 employees, but there is no monitoring if this is followed. “We have the policy, what is lacking is its implementation and enforcement,” admitted Hum Kala Pandey, Under Secretary of Ministry of Women, Children and Social Welfare. The government is trying to catch up with the tactile sidewalks in the city centre, but there is a long way to go in ensuring full mobility for visually impaired people in a city that is dangerous even for sighted people. 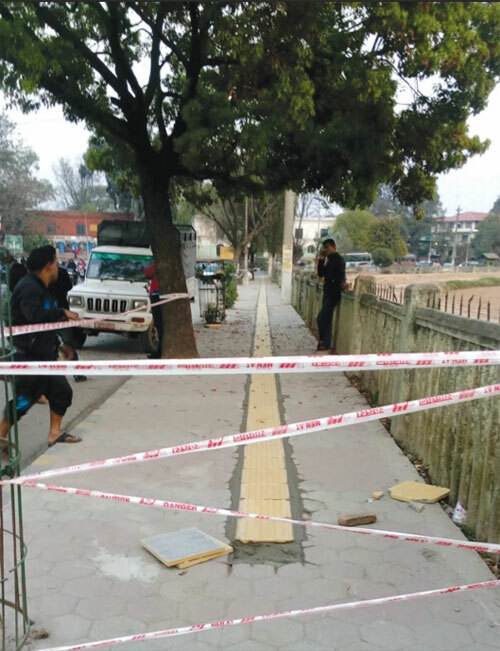 HELPING HANDS: Kathmandu Sustainable Urban Transport Project’s tactile sidewalks, like this one in Bhadrakali was delayed due to the earthquake and blockade. 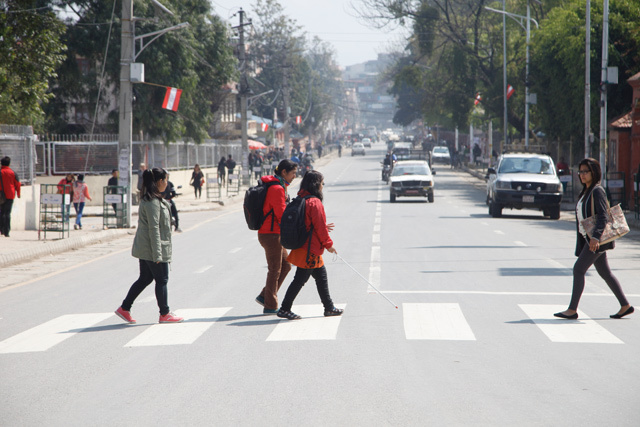 Said Kumar Thapa of the Nepal Association for the Welfare of the Blind: “It is very difficult to move around, manholes are left open, there are poles in the middle of the footpath, cars are parked everywhere." 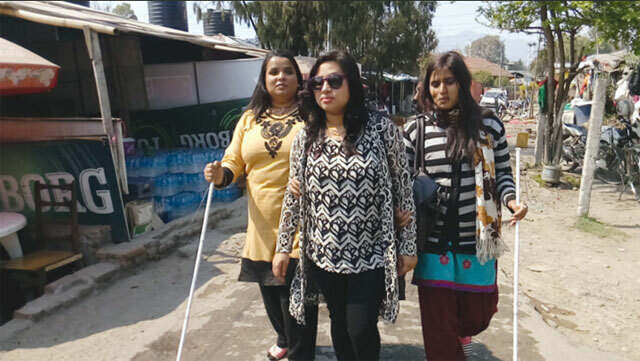 When sisters Narayani and Sunita Dawadi (pictured above) both blind since birth, started working as telephone operators at Tribhuvan International Airport, co-workers scoffed. “They thought we were a burden to them and I was determined to prove myself,” recalled Narayani. Both studied at the Purvanchal School for the Blind in Dharan and Laboratory School in Kirtipur. 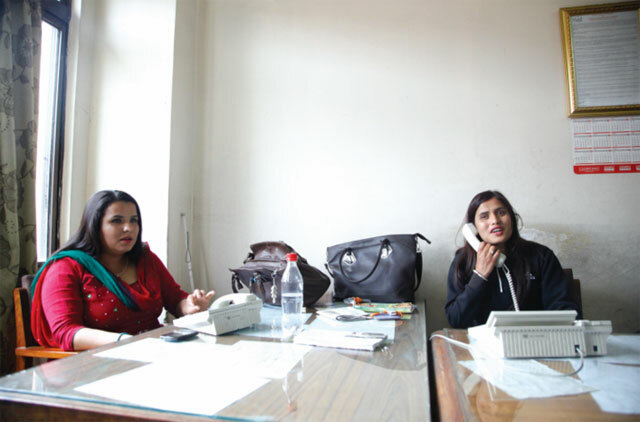 Narayani has completed her Masters from Dilli Bazar Kanya Campus, while Sunita’s thesis is underway. “Education has played a vital role in our lives. Without education, I would not be able to talk to you or would not know what is going on,” said Narayani, who is disappointed about the lack of books in Braille and help in sitting for exams. However, their conviction and will to become self-reliant have seen them through the challenges and brought them to where they are today. And the sisters’ co-workers have changed their mind about them weighting down the office. Eight more jobs openings for the blind have been announced at the airport after management saw their performance. "There will be no constitution if political parties continue to act like this"